Recorded on 2 portable MiniDisc Players and 2 very cheap stereo microphones on the 21st of April, 2005 in Berlin, Paris, Prague, St.Petersburg and many places in between. Edited by Koen Nutters with 3 Portable Minidisc Players and a little mixer. Version 2 has some additional editing and done in PEAK 4 (but not much). Jozef van Wissem - Renaissance and baroque lute and electronics with manipulated field recordings in mirror image. A piece commissioned by Buma Cultuurfonds. "Dutch composer and lute player Jozef van Wissem specializes in electronics, field recordings and original palindromic compositions for the lute that sound the same when played backwards or forward. Recent offerings have paired Van Wissem with guitarists Gary Lucas and Tetuzi Akiyama, but he returns to the solo format for 'Objects in Mirror Are Closer Than They Appear'. 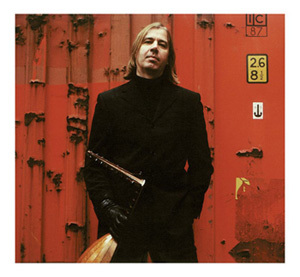 Though van Wissem draws inspiration from renaissance period forms, the use of computer-edited airport recordings fixes these pieces fimly in the now, and this approach to the lute is such that this CD would not be out of place in the John Fahey section of your music collection. Dreamy, oblique and minimal, the music insinuates itself into the listener's mind like a subliminal message or an overheard snippet of conversation." Travelator /n. - a word coined in the 1950's to describe moving walkways.These travelators are all situated at Schiphol airport, Amsterdam. Travelators move at 3 km/h, so an exposure time of 1.5 seconds is equal to a movement of 1.24999 meters. I cannot predict the movement rate of people on travelators.